Well, since I last posted about 23andme a lot has changed. I have had several of my close relatives tested. Also, the customer database of 23andme has dramatically increased in size. When I first got my results, I had only 214 cousins on the website, but as of today I have 657! During the past year, I have found out several interesting things about my genetic ancestry and I have also been able to confirm eight generations of my Napier line. I am planning to write about all of my experiences soon, but for today I thought I would do a post about my close relatives and just summarize who I asked to take the test and why I wanted them to get tested. Here is my full sister and how much DNA I share with her as well as the number of segments that we have in common. Siblings are expected to share about 50% of their DNA --- my sister and I share slightly more than expected, just by random chance. Getting your siblings tested at 23andme is very useful because they will have DNA (and relatives along that DNA) that you do not have. You can see that I share 53% of my DNA with my sister, but that leaves 47% that we do not share. Overall, 269 genetic cousins on 23andme have accepted contact with me & my sister. We both share DNA with 77 of them. Then there are 100 relatives that I share DNA with, but she does not. There are also 92 relatives that she shares DNA with, but I do not. 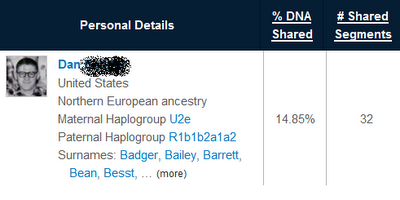 If I did not have her tested, I would have missed out on these 92 relatives. So to summarize, if you don't have parents available to test (mine are deceased), siblings are invaluable because they have DNA from your parents that you don't have. However, getting your sibling tested will tell you nothing about which side of your family a 23andme cousin comes from. After all, by definition, your sibling shares the same parents (and grandparents, etc etc) that you have. To try to narrow down which side of your family a 23andme cousin comes from, you have to turn to relatives that you have from only one side of your family. I have had my two half-sisters, my dad's double cousin, my paternal aunt, my maternal aunt, my maternal uncle, my maternal great-uncle, and my maternal great-aunt tested. Here is my comparison with my two half-sisters. The theoretical percentage shared between half-siblings is 25%. You can see that I share more than expected with one sister and less than expected with the other. Again, there's no real rhyme or reason for this, it's just random chance. Getting my half-sisters tested allowed me to sort out which of my parents many of my relative finder cousins came from. The "con" of testing half-siblings, though, is that they will have many matches that you do not have because you have only one parent in common. Here is my comparison with my aunts and my uncle. The theoretical percentage shared between an aunt/uncle and a niece/nephew is also 25%, the same as half-siblings. You can see that I share almost that exact amount with my two aunts, but slightly more with my uncle. The difference between your half-siblings and your aunts & uncles, in terms of DNA testing, is that you are related to all of the 23andme cousins that your aunts and uncles have. Even if you don't share a DNA connection with them, you are genealogically related because your aunts and uncles don't have any ancestors that you don't have. Your half-siblings do. So to a greater degree than with my half-siblings, I can identify relatives and make a genealogical connection with someone, even if I personally do not share any DNA with that person. I have also had my maternal great-uncle as well as my maternal great-aunt tested (my grandmother’s siblings). The theoretical percentage here is 12.5%. You can see that I share a bit less than expected with each one. Getting my great-aunt and great-uncle tested has been very useful because it allows me to identify many relatives that come from my maternal grandmother’s side of the family. And what I said before applies to this relationship too --- even if I don’t personally share DNA with all of the 23andme cousins that they have, they are still my relatives because my great-aunt & great-uncle do not have any ancestors that I do not have. And last but not least, I have tested my dad’s double cousin. I wrote in a previous post about what a double cousin is, as well as more info about the double cousins in my family. But I will summarize here --- double cousins share all four of their grandparents in common rather than just two. This occurs when two siblings from one family marry two siblings from another family. My dad would be expected to share 25% with all of his double cousins. As his daughter, I have half of his DNA and therefore I would be expected to share half as much --- 12.5%. You can see that I share a little more than expected with this particular cousin. Double cousins are pretty rare, especially nowadays, but they are very useful in terms of DNA testing because (as with aunts & uncles) all of their relatives are your relatives because they have no ancestors that you don’t have. He also helps me to identify which parent my 23andme cousins come from. Just to clarify, you actually share 99% of your DNA with humanity. When you say you share ~50% of DNA with your sibling, do you mean 50% of the remaining 1%? You are right -- all humans are genetically ~99.5% similar. There are plenty of genes common to all humans that say things like "make a four-chambered heart," etc. But these similarities aren't too relevant for genealogy purposes. Spectacular article, Andrea! I love your site! I need to get my family tested, but might just have to wait for DNA day specials to come back again! Keep up the great work! Of course, as one person who got a report from 23andme stated: "I found out I was fat and bald," sometimes the report provides information we already know about ourselves. The challenge for getting personal genetic information is to understand how to use it to improve ones quality of life. Even find a few long lost relatives. My last name is very unique and anyone with my last name in the US is a relative of mine. GOTTLEIB Hohulin came to the US in 1859. We can trace the Hohulin family back to Switzerland in 1676. On facebook, when I do a search for Hohulin, I get some Russian Хохулин. Which is the Russian spelling of Hohulin. So maybe some of my relatives migrated from Russia to Switzerland or from Switzerland to Russia. If I have my DNA analyzed, maybe I will learn something of this migration. Very informative post, the confusing sibling part is what is hard to understand, obviously identical twins look alike so they have the same dna, however siblings have different dna, in other words even though you have half of mom's and dad's dna, your sibling can have less than half of yours,grandparents and shuffling have to do with this, however I wish I can gain more insight in to this, siblings do share identical strands of dna, unlike other folks and your parents share exact strands of half-identical dna, so paternity/sibling test is accurate, this is the case of bin laden, there was no full sibling to test from and no father/mother so circumstantial evidence had to be used, the y chromosome is another tool to compare and use a half-sibling if you are male, borderline is 4th cousins, even though they share .75 of dna, apparently humans have shuffling so a much distant related human can have .75 dna in common. To the author does the sister with dna of over 30% vs. under 25% half-silbling look more or less identical to you? Have you tested cousins or post the graphs. One of my parents has past, if I get the other tested and it turns out that its lets say 45% would the other parent be predicted as precisely 55%? @Brian Hope you will be able to get everyone tested! It is a lot of fun, at least I think so. @Doug You are right, it is pretty amazing what the future holds & we can learn about our DNA now. If you are really interested in your direct paternal line, you may want to look into the Y-DNA testing offered by Family Tree DNA. They are able to look at the Y-chromosome more specifically than 23andMe does (23andMe focuses mostly on autosomal DNA for genealogy). I myself have never had any need to do a paternal DNA test and so I don't have much experience in that area, but many genealogists have taken the Y-STR test offered by FTDNA. @KrisB I am not too familiar with Osama's DNA test. I am not sure what type of test it was or who they tested to compare him with. I am guessing it was probably some sort of STR test like the kind used by the FBI -- this is not the same type of test used by 23andMe. @Alex The parent/child relationship is actually the one relationship that doesn't vary. Siblings, aunts/uncles, etc. all vary, but you always get half your DNA from your mom and half from your dad, period. Wow, I just sent you a message thru FB asking if I could add follow your blog. So I clicked on this link thru your FB ancestry.com post and I see that you have a Napier line? That is crazy..so do I!!! My GGG Grandmother was Laura Frances Napier..I believe her parents to be Benjamin Ennett Napier & Julian Ann Hughes. I can give you some more detail if you would like..just let me know! It would be cool if we were cousins! Let me know if anything looks familiar. Just wanted to let you know this was REALLY HELPFUL in trying to help me figure out DNA percentages with various relatives. My 23andme results showed a 20% match with someone! If only it wasn't anonymous b/c i have no idea who it is! Can you determine between mother/daughter pair and sister pair if mother is dead (without exhumation for bone or tooth sample, that is)? Younger sister is claiming older sister is her mother and will not believe medical records or relatives. It would seem that both relationships share the approximate same % of DNA. Check out my guest post at Geni.com!